Joerg Niehage (Germany) studied Communications Design at the University of Applied Science in Darmstadt. His work operates between the fields of graphic design, installation and sound art. 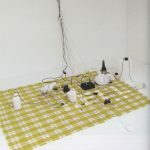 Niehage has participated in exhibitions and festivals that include Ars Electronica (Linz), Transmediale (Berlin), FILE 2009 (Sao Paulo), Transitio_MX (Mexico City), Schirn Kunsthalle (Frankfurt), Lab30 (Augsburg), the Athens Video Art Festival, and Mousonturm (Frankfurt).